Dogs love frozen treats because it’s refreshing, delicious and calming. This easy recipe only requires two nutritious ingredients. Yogurt contains probiotics, which balances our digestive system. Watermelon is a great source of vitamins A, B6, C, lycopene, antioxidants, amino acids and modest levels of potassium. Frozen treats are great when a dog is nervous for situations like fireworks or thunderstorms because it’s long lasting, and keeps them busy. It can also be used as a high value, crate training treat to help your dog love his crate. Blend the ingredients in a blender or hand mixer to liquify the yogurt and watermelon. Pour the mixture into an ice cube tray or a silicone mold in fun shapes. If you want to use the treats to reduce anxiety, freeze the mixture in small bowls that are appropriately sized for your dog. Offer the whole bowl to keep them busy when your dog is nervous, preferably BEFORE thunderstorm or fireworks start. 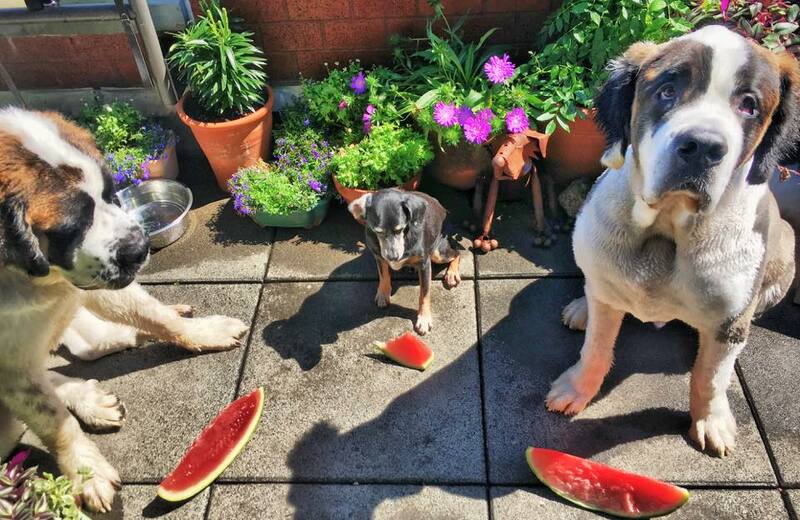 Change the fruit seasonally to suit what your dog prefers!